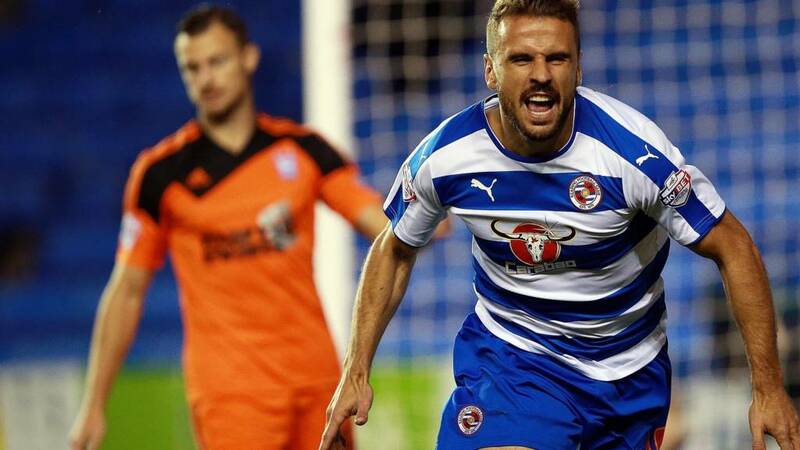 Was tonight the night we saw a new, resurgent Reading side capable of challenging for promotion this season? Well, they will certainly be there or thereabouts come May if they keep scoring as freely as they did this evening. The match ball belongs to Orlando Sa. The Portuguese striker brought his A-game tonight, that's for sure, while Nick Blackman and Oliver Norwood also impressed. You can re-live all six of tonight's goals in Adam Williams' fine match report. Thanks for joining us - we'll see you again tomorrow at 12:15 BST for more Championship action. "We've got some great attacking players and we're causing problems for most teams we're playing against, so long may it continue. "We're confident in the way we play and we produced it tonight." "The boys up top did the job and that is a fantastic team performance. It is something that we deserved, definitely. "It was nice to get off the mark for the season, and hopefully I can add a few goals." "It was really good to score three goals and, most important was the performance of the team. The team is playing really good, and now we need to continue like this." The referee calls time on a night to remember for Reading, and a second half to forget for Ipswich Town. It was an impressive win in the end for the Royals. A late booking for Ipswich left-back Jonas Knudsen, who tugs back Ola John. David McGoldrick curls a decent effort at goal but that is easily saved by Reading goalkeeper Jonathan Bond. We are about to see three minutes of added time. Ipswich cannot wait for the final whistle. Jordan Obita almost adds a sixth for Reading, but on his right, weaker foot, he pokes wide of goal from the edge of the area. What confidence Reading are showing though - it is strange to think that they hadn't actually scored a home goal since April before tonight. Quote Message: You watch the goalkeeper - he doesn't move, other to see where the ball's gone. What a strike from Oliver Norwood, and it tops off a fantastic night for Reading. You watch the goalkeeper - he doesn't move, other to see where the ball's gone. What a strike from Oliver Norwood, and it tops off a fantastic night for Reading. Oliver Norwood. Take a bow. That's a sublime, swerving, long-range strike that nestles beautifully in the top corner of the net. Goalkeeper Dean Gerken had no chance. Reading have a resounding five goals. Orlando Sa leaves the field to huge applause from the home fans after his match-winning hat-trick. His job is done for the night. Hal Robson-Kanu comes on in his place. This game appears to be slowly winding down, as Ipswich seem to have lost some urgency since conceding the fourth. They aren't going to get anything from this game, and they know it. Ainsley Maitland-Niles volleys over, after their best move for a good 10 minutes or so. Quote Message: Ipswich have looked decent, created some decent chances, but Freddie Sears has just dribbled the ball out of play for a throw-in. That probably suggests that it's not going to get much better for them this evening. Ipswich have looked decent, created some decent chances, but Freddie Sears has just dribbled the ball out of play for a throw-in. That probably suggests that it's not going to get much better for them this evening. The hosts make a change, with Matej Vydra coming off for another debutant, Lucas Piazon, who is on loan from Chelsea. The Watford loanee will be relatively pleased with his performance tonight, I'd say, despite perhaps lacking a touch of match sharpness - that will surely come with more game time. And Nick Blackman is replaced by Ola John, in another Reading change. Blackman's been superb tonight. Ipswich's Jonathan Douglas tries to burst into the penalty area but his touch is too heavy and the ball trickles through to Reading keeper Jonathan Bond. It has to be said, Reading's Nick Blackman has been brilliant tonight. He has contributed a goal and two assists, while being a constant nuisance to Ipswich's back four. If he continues to play like this, he will be a handful all season. And he netted twice last time out, too. That's a man in form. "That's what you call a game of inches. "Moments before, Brett Pitman was a width of a crossbar away from pulling Ipswich back into it at 3-2. "Once again, the visitors give the ball away cheaply, Nick Blackman showed his pace once more and Orlando Sa had a simple finish for a hat-trick and 4-1. "Ipswich look dead and buried now." Mick McCarthy makes a double change, with Daryl Murphy and Ainsley Maitland-Niles coming on for Brett Pitman and Ryan Fraser. Quote Message: Nick Blackman's done brilliantly. Lots of Ipswich players were back-pedalling but Blackman's got to the byline and Sa's got the easiest of tasks to tap it in from six yards. Nick Blackman's done brilliantly. Lots of Ipswich players were back-pedalling but Blackman's got to the byline and Sa's got the easiest of tasks to tap it in from six yards. Moments after Brett Pitman headed onto the bar for Ipswich, Reading go straight down the other end to effectively finish this game. Nick Blackman teases the visitors' defence, gets to the byline and cuts the ball back for Orlando Sa, who slots home first-time and bags his hat-trick. Game over? Quote Message: Ipswich are not being anywhere near as creative as they were in the first half. It won't be long before we see Daryl Murphy come on, just to give them an added dimension. He just might be the answer. Ipswich are not being anywhere near as creative as they were in the first half. It won't be long before we see Daryl Murphy come on, just to give them an added dimension. He just might be the answer. The Tractor Boys have scored exactly two goals in all of their league games so far this season. They're going to need more than that tonight, if they're to avoid defeat. They do have options on the bench, including striker Daryl Murphy, who is always a threat. Reading's Matej Vydra tries to curl into the top corner from the edge of the D, but his shot doesn't bend towards goal enough, and goes behind for a goal kick. What can Mick McCarthy's men conjure up in response to that third Reading goal? The former Republic of Ireland manager took Ipswich to the play-offs last season, and the Tractor Boys have started well in 2015-16. But they're on course for consecutive Championship defeats, unless they can produce a fine comeback in this second half. Ipswich's Freddie Sears has a pop from the corner of the penalty area, but his effort clips the back of the net and won't be troubling Jonathan Bond. Ipswich will need to do better than that is they are to get back into this. Quote Message: What a finish by Nick Blackman! The goalkeeper never sniffed it. He didn't have time to react - a fantastic finish. What a finish by Nick Blackman! The goalkeeper never sniffed it. He didn't have time to react - a fantastic finish. Nick Blackman almost breaks the roof of the net, as he smashes home from a tight angle six yards out to give Reading a two-goal lead. Orlando Sa could have had his hat-trick, as he pounced on hesitant Ipswich defending in their own penalty area. His poked effort wasn't cleared and it fell to Blackman, who lashed in his fourth goal of the season high into the top of the net. Ipswich have the first chance of the half, as the ball bounces for Brett Pitman outside the area, but his connection on the half-volley isn't quite perfect, and he blasts wide. Remember, if you've got any thoughts about tonight's game, get in touch using #bbcfootball on Twitter. Ipswich get the second half started. They're kicking towards their travelling fans for the next 45 minutes. You could call it ruthless finishing - we've seen three goals from just five shots on target. The stats also show that Ipswich have had fractionally more possession that the hosts, but can they turn that into more goals in the second half? Tonight's game is just the start of a jam-packed weekend of Championship fixtures, and the first of three live text commentaries that we'll be bringing you along the way. QPR host Nottingham Forest tomorrow at 12:30 BST, as Rangers resume their bid for an immediate return to the Premier League. And on Sunday at 12:00 BST, Fulham welcome Blackburn to Craven Cottage, with Rovers still looking for their first win of the season. "That was a half that absolutely flew by. "Compared with Reading's two other home matches so far this season, both drab 0-0 draws, that was unending entertainment. "Steve Clarke's side look full of pace and intent, while Ipswich look guilty of over-committing in attack. "Mick McCarthy will have been delighted with the immediate response with the equaliser but furious with the lack of closing down before Orlando Sa's second restored the lead." Quote Message: Reading set their stall out in the first 20 seconds. Matej Vydra chased after a ball and took a quick throw-in. It was like the glory days again - get up and at them in the first five minutes of the game. Reading set their stall out in the first 20 seconds. Matej Vydra chased after a ball and took a quick throw-in. It was like the glory days again - get up and at them in the first five minutes of the game. So, Orlando Sa's double sees the home side lead 2-1 at the break. Reading's summer signing from Legia Warsaw netted twice in quick succession, either side of Freddie Sears' tap-in for Ipswich. It was fun to watch. At times it was end-to-end, non-stop action. But that action has paused - for just 15 minutes. Stick with us for the second half, this is a good one, for sure. Quote Message: It's been superb to watch. It started really well. Ipswich came out of the traps nicely and Reading responded well. We had that real burst of goals at the start and the half has tapered off a little, but it's been very entertaining all of the way through. It's been superb to watch. It started really well. Ipswich came out of the traps nicely and Reading responded well. We had that real burst of goals at the start and the half has tapered off a little, but it's been very entertaining all of the way through. Well, the Championship came back with a bang. What an excellent first half - three goals in the first 15 minutes, and Reading lead 2-1 at the interval. David McGoldrick is correctly adjudged to be offside, but his shot trickled wide anyway. Ipswich have ended this half well, but they still trail. Three minutes of added time have been indicated, at the end of this entertaining first half. Quote Message: I said before the game that I thought it would be Reading's sternest test so far. It's been a really good, entertaining game. I said before the game that I thought it would be Reading's sternest test so far. It's been a really good, entertaining game. David McGoldrick really should have scored there. The Ipswich striker is well positioned to head home an inch-perfect corner, but he heads wide. Was he pulled back there? There are some mild appeals from Ipswich, but it would have been a soft penalty. A third Ipswich player goes into the referee's book, as this time Ryan Fraser is punished for a cynical foul. He was nowhere near the ball, but stuck out a leg to stop Oliver Norwood. Mick McCarthy won't be impressed with that. Quote Message: The break by Reading was superb. That's twice Reading have done it and they've looked very dangerous when doing so. The break by Reading was superb. That's twice Reading have done it and they've looked very dangerous when doing so. The hosts, once again, break with real pace. This time Ipswich defender Christophe Berra does well to cut out the final pass. Seconds later, Matej Vydra almost plays Orlando Sa through with a first-time ball, but it is slightly overhit. Ipswich's Cole Skuse is booked for a deliberate trip on Aaron Tshibola. The referee didn't have much choice there. Ipswich captain Luke Chambers is booked for a late challenge on Stephen Quinn five yards from the left corner of the penalty area. From the resulting free-kick, the ball bounces right in front of Dean Gerken, and he turns it just around the post, but the linesman had already flagged for offside. What's this, we haven't had a goal for 15 minutes? Reading break quickly again, and get themselves into a good position, with four men forward, but the final pass from Matej Vydra is intercepted and Ipswich remove the danger. Every time Reading come forward, they are doing so with real intent. Nick Blackman looks very lively tonight, as does debutant Matej Vydra. There could be plenty more goals in this one, at this rate. At the other end, Ipswich's Ryan Fraser steps inside and blasts just over, from about 20-25 yards out. The Tractor Boys almost draw level again, as Freddie Sears beats the offside trap and then brilliantly cuts inside, into the six-yard box, but fires over the bar. What a chance for Ipswich that was. Reading are certainly looking an exciting proposition going forward. Matej Vydra, although he hasn't found the net himself yet, could prove to be an inspired signing by the Royals. Jonas Knudsen has a go from range for Ipswich and it was certainly worth a try. His bouncing shot goes just wide of the left post. Let's just calm down and take a deep breath, shall we? Portuguese striker Orlando Sa will be delighted with his early brace. At the other end, David McGoldrick breaks with pace but is crowded out by three Reading defenders and it is cleared. "Well, what a start. Not a lot of quality defending to speak of, but some pretty direct attacking. "Orlando Sa looks full of confidence for Reading after getting himself off the mark for the Royals in their previous match against Brentford. In new signing Matej Vydra, he looks to have the perfect foil. "Ipswich do not look comfortable against either of those two, or indeed Nick Blackman out wide on the right for the hosts." Well, if the last six minutes are anything to go by, we are in for a treat tonight. The Madejski didn't see any league goals in August, but we had three inside the first 15 minutes. Despite the results between these two teams always seeming to be close, Reading have won seven of the last eight meetings and Ipswich have only won one of their 10 away games against the Royals. Quote Message: What a counter-attack by Reading. The ball's a bit behind Sa but he gets it out of his feet and puts in a thunderous shot, which has gone in just off the inside of the post. What a counter-attack by Reading. The ball's a bit behind Sa but he gets it out of his feet and puts in a thunderous shot, which has gone in just off the inside of the post. Orlando Sa fires Reading straight back into the lead with a perfect, low finish from outside the area. It was a swift counter attack, led by Oliver Norwood and then taken on by Matej Vydra. Wow, what a start at the Madejski. Quote Message: It's a wonderful response because Reading were beginning to look very, very good and in charge of the game. It's a wonderful response because Reading were beginning to look very, very good and in charge of the game. Well, we could be in for quite some game tonight! Ipswich level immediately through Freddie Sears. Ryan Fraser made the goal, showing really quick feet to beat two defenders and make space for a shot. It was saved by Jonathan Bond, but he palmed the ball straight into the path of Sears, who couldn't miss and duly knocked the ball into an empty net for his fourth goal of the season. What a start for Reading! Orlando Sa finds the net with a powerful, downward header into the bottom corner. Matej Vydra gathered a poor Ipswich clearance and found Nick Blackman, whose left-footed cross picked out Sa, and the striker nets Reading's first home league goal since April. Reading's Jordan Obita looks to be in pain. He slid in with a strong, clean tackle on Freddie Sears, but looks to have come off worse. The delivery goes over everyone's heads and comes to nothing. That bright start has got the Royals fans going though. Ipswich are playing in their bright orange shirts, shorts and socks, while Reading are in their traditional blue and white. Reading get things started at the Madejski Stadium. Quote Message: Christophe Berra has proven to be a solid defender. He's very tenacious and adds a lot of strength to the back line. Now that he's available, this is very much the manager's first-choice back four. Christophe Berra has proven to be a solid defender. He's very tenacious and adds a lot of strength to the back line. Now that he's available, this is very much the manager's first-choice back four. Scotland international Christophe Berra is fit again after injury and starts in the centre of the Ipswich defence alongside Tommy Smith this evening. Remember those fine August evenings when it was still light at the start of a match? Well tonight the players head out into the Madejski under a dark, night sky. Autumn is officially here, I say. One other thing that happened during the international break was that the loan window for Football League clubs opened on Wednesday. So tonight we want you to tell us: which out-of-favour Premier League player would you most like your club to bring in on loan? Does your club need more experienced, defensive cover? Or a young, hungry forward with plenty to prove? You can get in touch about that, as well as with your views on tonight's game, by using #bbcfootball on Twitter. You can listen to tonight's game on BBC Radio Berkshire or BBC Radio Suffolk if you live in either of those areas. Unfortunately, a right issue prevents us from broadcasting Football League commentaries on the BBC Sport website. Subs: Bialkowski, Malarczyk, Parr, Coke, Maitland-Niles, Toure, Murphy. Subs: Al-Habsi, Hector, Robson-Kanu, McCleary, Piazon, Williams, John. "Two changes to the starting line-ups of both sides this evening. "For Reading, it's a debut for deadline day loan signing Matej Vydra in place of Wales international Hal Robson-Kanu, while Aaron Tshibola gets the nod in midfield ahead of Danny Williams. "Ipswich welcome Christophe Berra back from injury in the centre of defence and David McGoldrick also returns up front alongside Brett Pitman and Freddie Sears. "Josh Emmanuel and Ashley Maitland-Niles are the ones to miss out." Yes, after the fun and games of the international break, the Championship is back tonight as Reading host third-placed Ipswich Town. The Royals are unbeaten in their last six games in all competitions, while Ipswich have won five of their last six. A win would see Mick McCarthy's side go top, until at least tomorrow afternoon. Good evening, Championship football fans! Now, where were we? It is only 13 days since Brighton won 3-2 at Ipswich to go top of the league. Can the Tractor Boys return to the Championship summit tonight? Or will Reading leap into the top six?